President Trump and first lady Melania Trump arrive to visit members of the U.S. military during an unannounced trip to Al Asad Air Base in Iraq on Wednesday. Reporters traveling with Trump, as has happened with past presidents, were not allowed to report that the president was in Iraq until the end of the visit for security purposes. 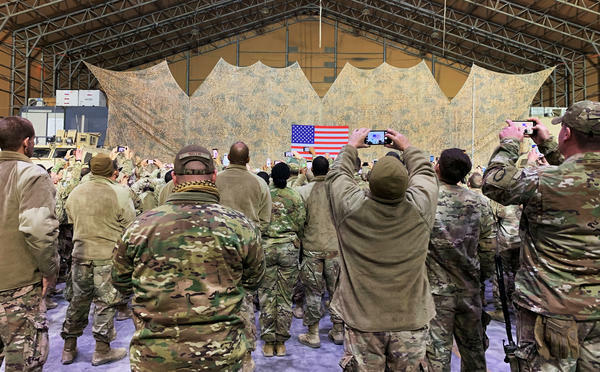 U.S. military personnel listen to President Trump speak at Al Asad Air Base on Wednesday. The call came Sunday afternoon. "Can you come to the White House?" I was still wearing running pants and had my hair up in a plastic scrunchy, but figured there wasn't time to change. I was called to the office of White House press secretary Sarah Sanders, who had me leave my purse and cellphone outside before sitting down. This was sensitive. The president would be going to Iraq, leaving late Christmas night. I would be one of 13 pool journalists along for the surprise trip. For security reasons, it had to stay quiet. I could tell only my husband and one editor. And only in person, not over the phone, text or email. The secrecy around it was similar to how previous White House staffs had handled surprise trips by former Presidents George W. Bush and Barack Obama to Iraq and Afghanistan. President Trump had been hinting for some time that he would make a visit to a combat zone. 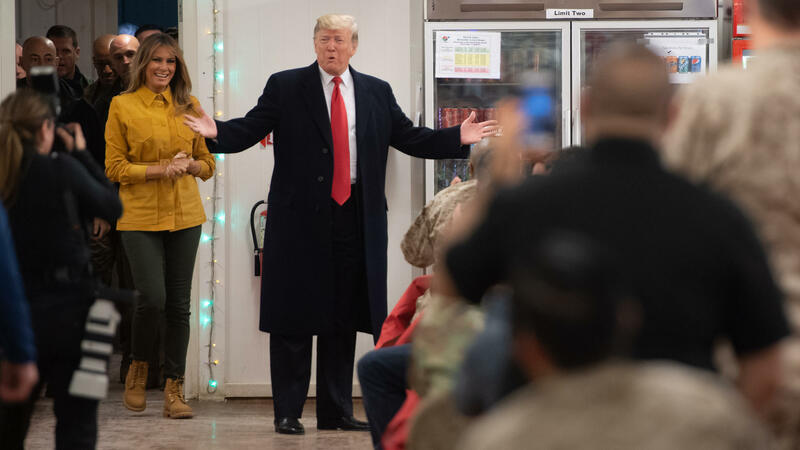 He had taken heat for making it so far into his presidency without visiting troops deployed in Afghanistan or in the fight against ISIS in Syria and Iraq. He had told Chris Wallace on Fox News Sunday that he would go but "had an unbelievable busy schedule," generating even more controversy. So it wasn't entirely a surprise that he would make a trip around the holidays. But then Trump announced he was pulling all American forces out of Syria and ordering the military to cut the number of troops in Afghanistan in half. Secretary of Defense Jim Mattis resigned in protest. And there was the government shutdown. It seemed like an inopportune time to make such a trip. Or maybe it was the perfect time. I went home and told my husband we'd have to postpone our family vacation for a day. Oh, and I was going to Iraq and leaving him with our two kids, 6 years and 8 months old. And he couldn't tell anyone what was going on. My editor and I met at a cafe near my house. When she sat down, I passed her my notebook with the few details I had written out. We couldn't risk someone overhearing our conversation. Then we went into planning mode. How would we get everything out to all the other radio outlets and get the news onto NPR? What happens if there is no cellular data service? The next day was Christmas Eve and I went to NPR's booth in the basement of the White House just like normal. At one point I was talking to an editor who didn't know about the secret trip about coverage on Christmas Day and whether I'd get called in. He said, "It doesn't look like he's going to Afghanistan." Nope. I didn't say a thing. Christmas Day I was on the UpFirst podcast at 5 a.m., but after that it was quiet. We met up with our friends and their kids to see the new Spider-Man movie. I was tired and on edge, worried about the trip (as much about getting the foreign policy right and not screwing up my pool duties as about my safety) and desperate to tell this very close friend what was going on. But I couldn't let on. Later I texted with my parents and brother and couldn't tell them either. At some point I got an email from Sanders with the details. Meet at 9:30 p.m. at Joint Base Andrews, the military facility outside Washington, D.C., where Air Force One is based. We entered through an unlit gate you'd never know was there unless you were looking for it. As a White House reporter, I've flown on Air Force One more times than I can remember (though that probably just says something about my memory) and it was never like this. Normally, the iconic blue and white jumbo jet sits on the tarmac awaiting the president's arrival on Marine One, with TV cameras rolling. This time we boarded inside a massive, pristine hangar. The president left the White House in secret. Air Force One would take off just after midnight, in darkness, shades drawn so no one would see it and spill the news. The flight was long and uneventful. Near the end, an Air Force steward came through and asked us to make sure to leave our shades down. The lights were turned off too. When we got off the plane at Al Asad Air Base in Iraq it was pitch black outside, and we walked to a building on a dirt path lit by green and purple glow sticks. Trump marveled at the security around his arrival in Iraq. Asked if he had any concerns about making the trip, Trump said, "Yeah, I had concern, but my bigger concern was maybe [for] the people that were with me." He even thanked the press pool for coming along, out of character for a president who instinctively refers to reporters as fake news. "You knew where you were going, and we appreciate your coming with us, very much so," Trump said. "That takes courage also. We very much appreciate you coming with us." The traveling press agreed to keep information about the trip embargoed until just before the president's visit was over, because of security concerns. Our cellphones were all scrambled anyway, so we had little choice. But it started to get out. Amateur flight trackers noticed the unusual plane model leaving the D.C. area, a VC-25, the specially modified Boeing 747 that serves the president. Someone tweeted a photo that appeared to show Air Force One flying over the U.K.
Back in Washington, it was noted that the president himself was unusually silent on Twitter. In Iraq, Trump met with military leaders, including the commander of Operation Inherent Resolve. He softened his message that ISIS had been "defeated," saying service members were responsible for the "near elimination of the ISIS territorial caliphate" and that in that meeting he had come up with a great plan for victory, details to be revealed later. He defended his decision to pull all troops out of Syria against the advice of "the generals." He talked down years-long U.S. military entanglements, saying now that he is president, "we're not the suckers of the world." He and first lady Melania Trump visited a festively decorated dining hall where service members sat around waiting for a special guest. They gave a standing ovation when they walked through the door. Trump signed autographs (including on a few well-worn "Make America Great Again" hats service members brought along), took selfies and made sure the press heard from a soldier who said he had re-enlisted in the Army because of Trump. And, as he often does, Trump broke with norms. In a speech that would traditionally solely offer holiday greetings and gratitude for service members' sacrifice, Trump added a dig at Democrats in Washington over the stalemate on border wall funding that has led to the partial government shutdown. When the president finished his remarks to troops, we were finally allowed to report the news. But Wi-Fi and cellular data still weren't working. Sanders got out a tweet before the press corps had strong enough Internet access to file our reports. Rushing back to Air Force One, I called my editor and dictated a brief pool report, which was distributed to the rest of the radio networks. The secret trip wasn't a secret anymore. Moments later, Air Force One departed three hours after it had arrived, still in darkness, shades drawn. Sanders told us the president was pleasantly surprised that none of the reporters traveling with him leaked news of the trip.